When you are planning your wedding and reception, the theme that you choose will set the mood for the entire event. To help that theme flow through each part of your celebration, your decorations should tie together your colors and theme. One of the most important parts of pulling together your wedding and reception, and setting the mood for your celebration are the table centerpieces. Brides today have a wide variety of centerpiece options for making their reception unique and memorable. This option is for the bride who wants a traditional wedding and reception. 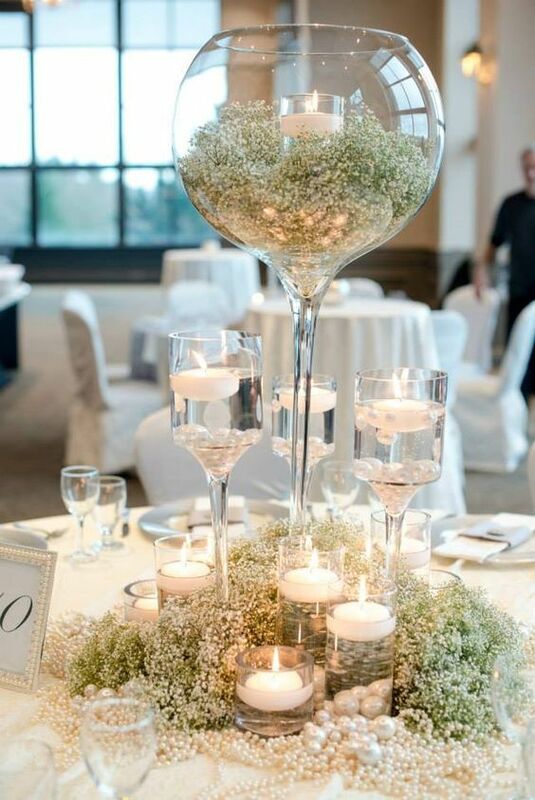 Blooms on tables typically match the flowers used during the ceremony or complement them. Simple floral arrangements can be made in clear or colored vases, and are perfect for the bride that wants to keep the feel elegant and traditional. For unique options, arrangements can be placed in tea cups, baskets, mason jars or wooden crates. 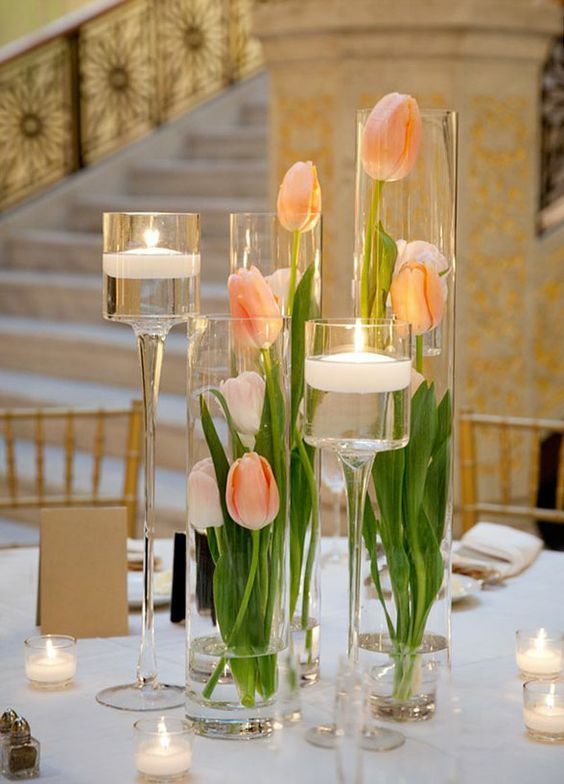 Single blooms can be floated in shallow bowls with floating candles to set a romantic mood. The options are endless. For the bride that wants to keep things natural, but doesn’t want a bunch of flowers everywhere, twigs and greens can be a perfect alternative. Twigs and small tree branches can be arranged on tables to look like small trees, giving a modern, simple and perhaps abstract feel. These little trees can be decorated with small floral garlands, ornaments, crystals, lights, framed photos or ribbons. They can also be a great way to incorporate your wedding favors, by hanging them in small bags from the branches. 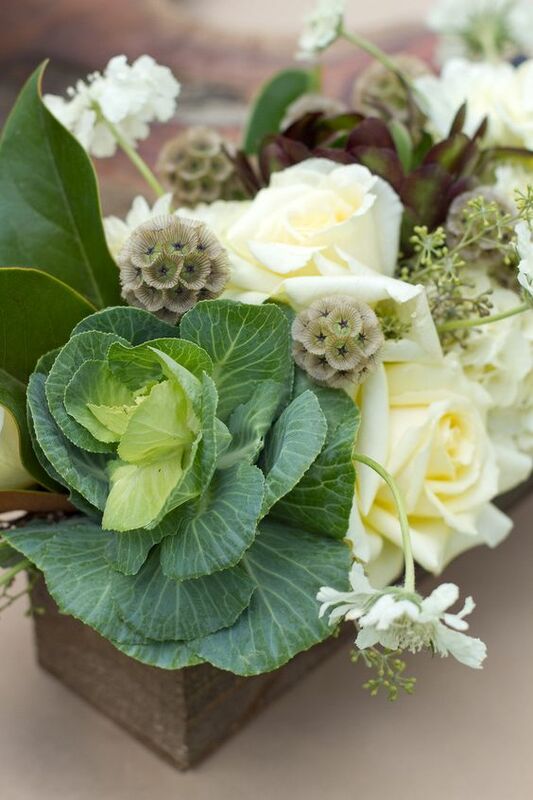 Greens such as ivy, moss, pine boughs, topiaries, wreaths and other simple greens can be used for an earthy and natural feel, and go well with most colors and themes. If flowers and greens aren’t your style and you are looking for something more casual and perhaps fun for your guests, try using food for your centerpieces. If you like the idea of choosing edibles that resemble flowers, incorporate cabbage, kale, and other veggies into your centerpieces. For something sweet, small hand-held desserts can be placed on tiered trays or on pretty plates to make a stunning but edible centerpiece. If you want to keep it fun, try setting out bowls of easy to eat candy, such as miniature candy bars, jelly beans or M&Ms. These treats are fun for adults and kids. Even better, companies like M&Ms and Jelly Belly will sell you candy in your wedding colors so that the treats on your tables match the rest of your decorations. If that is too simple, suckers and cupcakes can be placed on sticks or tied together to look like flowers and stuck in pots. Seasonal fruit can also be an attractive alternative to floral arrangements. Try stacking lemons and limes in tall hurricane vases. Or a bowl full of pomegranates and pinecones for a rustic, fall arrangement. For the bride that wants to shine a little light on her reception, there are fun options for lighted centerpieces. Candles are a great way to create an elegant, sophisticated mood and bring soft light to your reception venue. 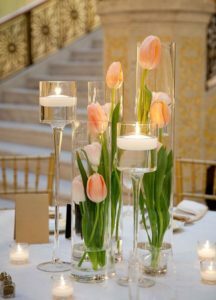 Candles can be placed on their own, with flowers or greens, or in a grouping and set on the table in a variety of sizes and shapes to create a warm glow and a unique look. If you are looking for something fancier, visit your local home decorating store, or even the second-hand store for fun and funky candelabras. If your venue doesn’t allow you to use live flame candles, don’t forget about battery operated candles or small table lamps. These can give you the same warm lighting, without the fire hazard. Games and activities can be a fun addition to the center of your tables. Not every guest loves to dance, and kids can get bored at weddings. For the bride that wants to set a fun and light-hearted mood, try adding games or other activities to your table decorations. 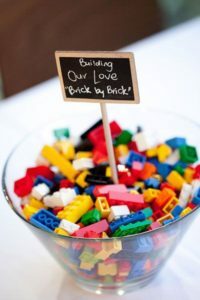 Games and activities might not be a great stand alone for centerpieces, but combine them with fun flowers or a tree filled with photos, and your guests are sure to be entertained all night long. If you want to get your guests to mix and mingle, try adding games like Jenga or pick-up sticks that a group of people can play, and are simple to set-up and even simpler to play. Markers and coloring pages can also be a great way to keep kids and adults entertained, and if done right, you can ask guests to color pages and create a collage of their art as a keepsake from your special day. When you are planning your reception decorations, make sure that they fit the feel and mood that you want to set for your day and your guests. If you are having a hard time finding decorations that fit your needs, Platinum Banquet Hall’s wedding professionals can help you with ideas and suggestions to make your special day even more memorable.